Over $20,000 Miracles For The Kids! 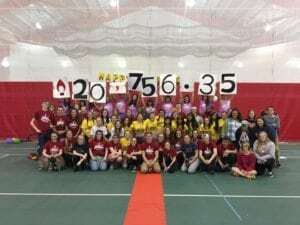 In the 5th year of OTTERTHON at Otterbein University, students came together to raise $20,756.35 For The Kids! On March 10th, 2017, Otterbein University students came together through OTTERTHON to raise a record-breaking $20,756.35 For The Kids at Nationwide Children’s Hospital! With an incredible and creative “birthday party” theme, these students fought to give kids at Nationwide Children’s more birthdays. A huge Thank You to all the amazing students who contributed to this accomplishment and the continued support of our patients. For The Kids! Previous post: Good Luck, OTTERTHON! Next post: Checking in on Panda Express!